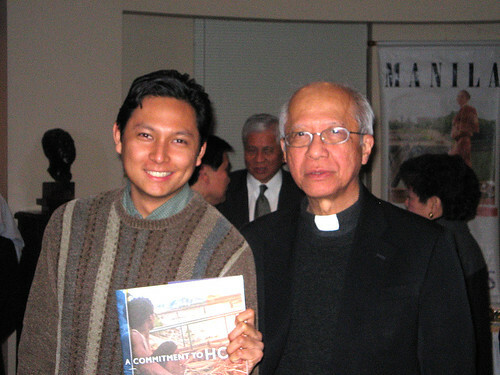 Here’s me with Father Bienvenido Nebres, SJ, president of my alma mater. He was at the Philippine Embassy tonight to promote Gawad Kalinga to the local Fil-Am community, so of course the local Ateneo Alumni Association was all there to greet him. In the background is Albert Del Rosario, Philippine Ambassador to the USA. Wow. Weird seeing Fr. Nebres with the collar. I always saw him in a barong.